Passivhaus or ‘Passive House’ is the fastest growing energy performance standard in the world with 30,000 buildings realised to date with the majority of those since the turn of the century. The Passivhaus standards strengths lie in the simplicity of its approach; build a house that has an excellent thermal performance, exceptional airtightness with mechanical ventilation! 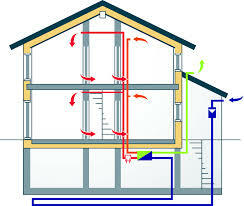 This robust approach to building design allows the designer to minimise the ‘Heating Demand’ of the building and in some residential buildings only specify a heated towel rail as means of conventional heating, this heat can then be recovered and circulated by a Mechanical Ventilation and Heat Recovery (MVHR) unit. The Passivhaus standard is sometimes confused with more generic approaches to passive solar architecture, with which it shares some common principles. Where the Passivhaus standard differs from more generic concepts is in its ability to reduce the permitted space heating demand and primary energy consumption. It can therefore be considered both as a robust energy performance specification and a holistic low energy design concept. In a Passivhaus thermal comfort is achieved to the greatest practical extent through the use of passive measures listed below which can be applied not only to the residential sector but also to commercial, industrial and public buildings. There are no strict requirements with respect to domestic hot water; lighting and appliance consumption the standard imposes an overall limit on the Primary Energy consumption which promotes energy efficiency in all of these areas.